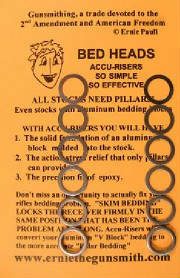 Convert your aluminum bedding block stock to the more accurate pillar bedding system. Remington M-700 in an H-S Precision, a Bell and Carlson Medalist, or a Remington Factory installed stock with an aluminum bedding block. H-S Precision Pro -Series 2000, in an H-S Precision stock. And Winchester M-70 in an H-S Precision or a Bell & Carlson Medalist stock.